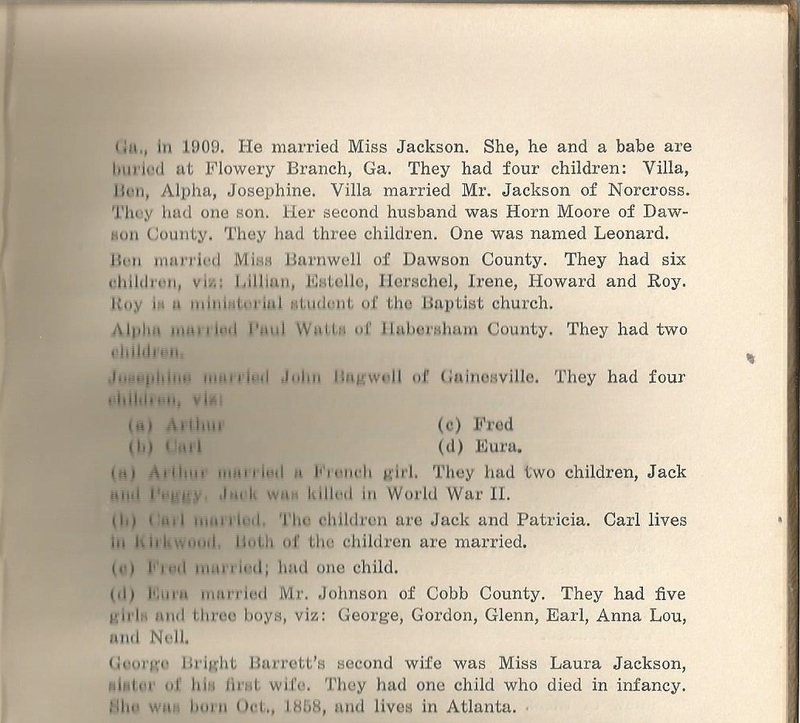 John R. “Jack” Barrett, Sr., was a son of John Barrett (born circa 1776) and his second wife, one Ms. Stanton. 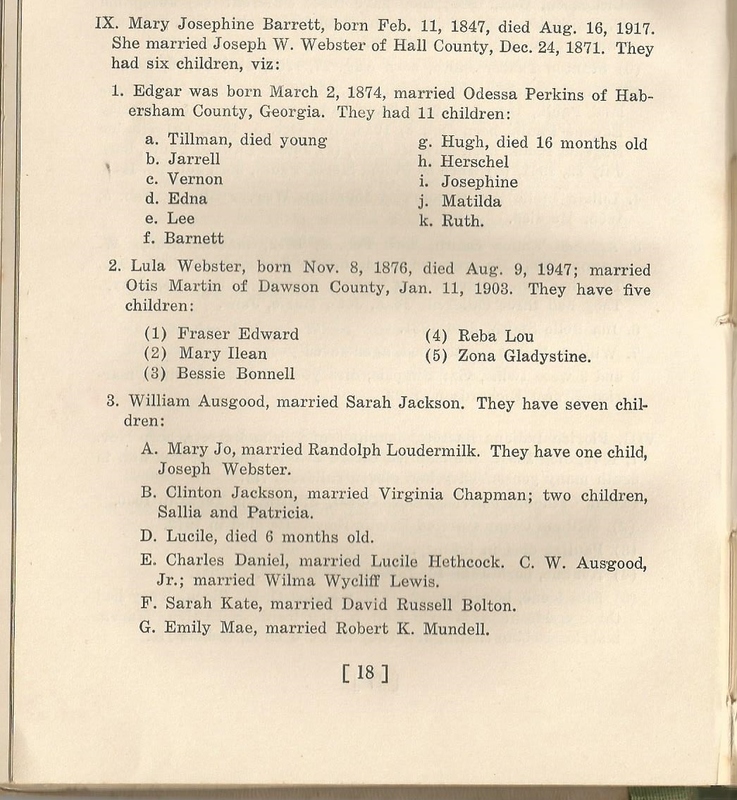 I descend from John Barrett and his first wife, Milly Rebecca Chastain Barrett through their son, Elisha Chastain Barrett (1806-1886). “Perino Barrett” was actually Isaac Parino Barrett, born July 15, 1865. 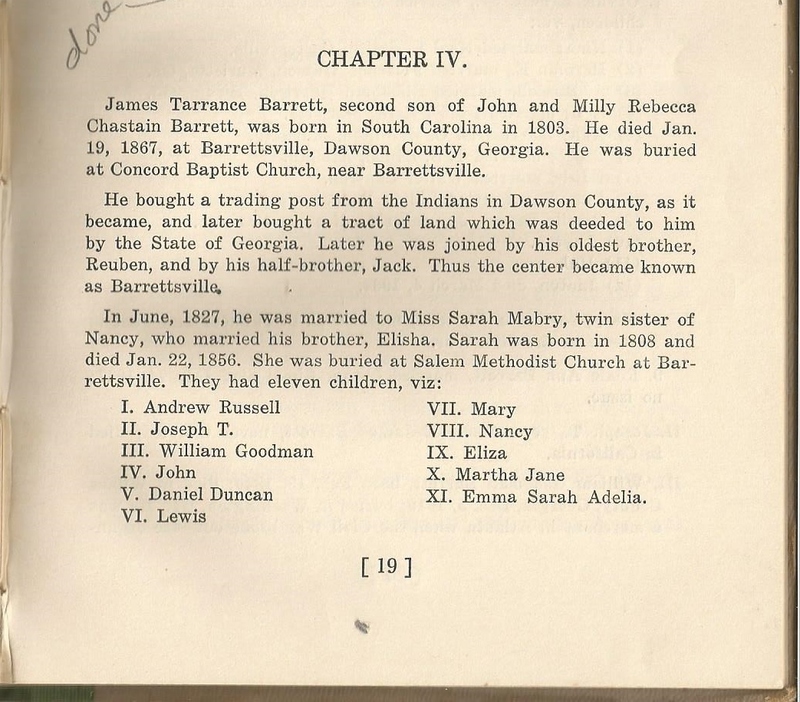 Isaac Barrett, his older brother, died July 23, 1862. 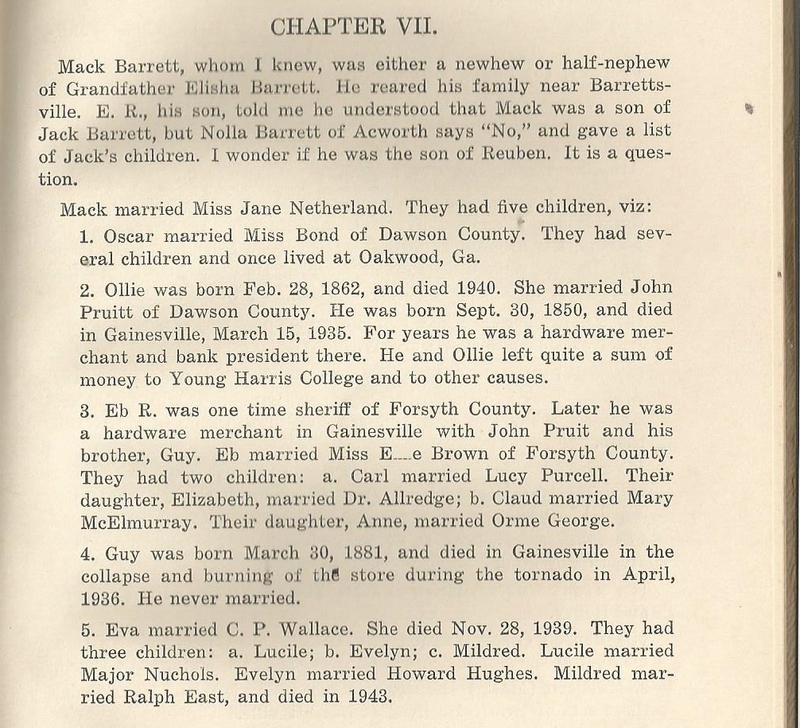 Isaac Parino Barrett moved to Mason County, Texas, and died in Fort Worth. According to findagrave.com, he died on February 4, 1936. Posted September 28, 2014 by neatnik2009 in Atlanta Georgia, Dawson County Georgia, Elisha Chastain Barrett (1806-1886), Fulton County Georgia, Gainesville Georgia, Hall County Georgia, John Barrett (Born Circa 1776), John R. "Jack" Barrett Sr., Milly Rebecca Chastain Barrett, Southern Georgia U.S.A.
Mack Barrett seems to have been either a son of the Reuben Barrett who was a son of John Barrett (born circa 1776) or of John R. “Jack” Barrett, Sr., part of John Barrett’s second family. The paternity of Mack Barrett is not in question, but the identity of his mother is uncertain. The Forsyth County Sherrif’s Department’s list of Sheriffs lists one E. R. Barrett as the holder of that office from 1898 to 1902. 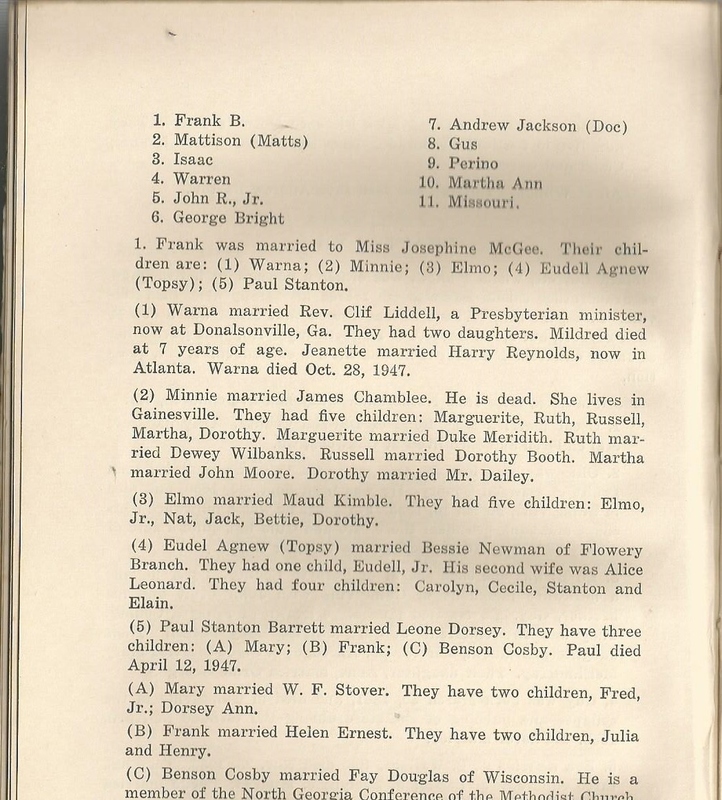 Posted September 27, 2014 by neatnik2009 in Dawson County Georgia, Elisha Chastain Barrett (1806-1886), George Washington Barrett Family History, James Tarrance Barrett (1803-1867), John Barrett (Born Circa 1776), Milly Rebecca Chastain Barrett, Nancy Mabry Barrett (1810-1849), Northern Georgia U.S.A. 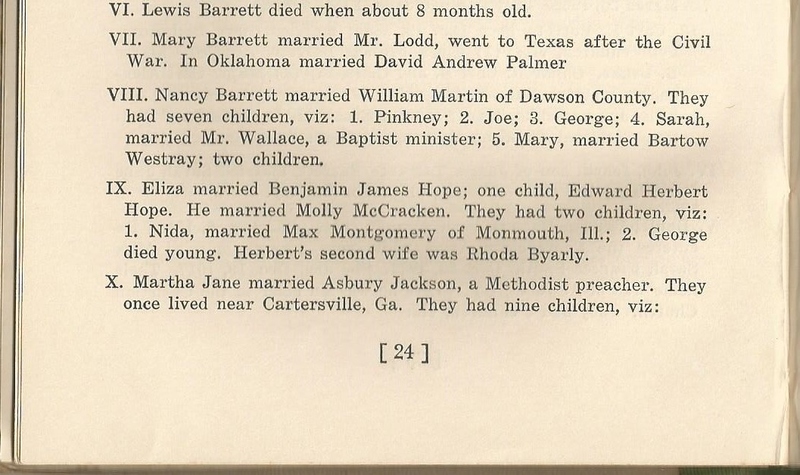 Tagged with Andrew Russell Barrett, Barrettsville Georgia, Daniel Duncan Barrett, Eliza Barrett Hope, Emma Sarah Adelia Barrett Barrett, Forest Chartley Barrett, Jack Barrett, John Barrett, Joseph T. Barrett, Lewis Barrett, Lumpkin County Georgia, Martha Jane Barrett Jackson, Mary Barrett Lodd Palmer, Nancy Barrett Martin, Rebecca Head Barrett, Reuben Barrett, Sarah Mabry Barrett, William Goodman Barrett Sr.
Mary Josephine Barrett Webster (1847-1917) was the ninth child of Elisha Chastain Barrett (1806-1886) and Nancy Mabry Barrett (1810-1849). 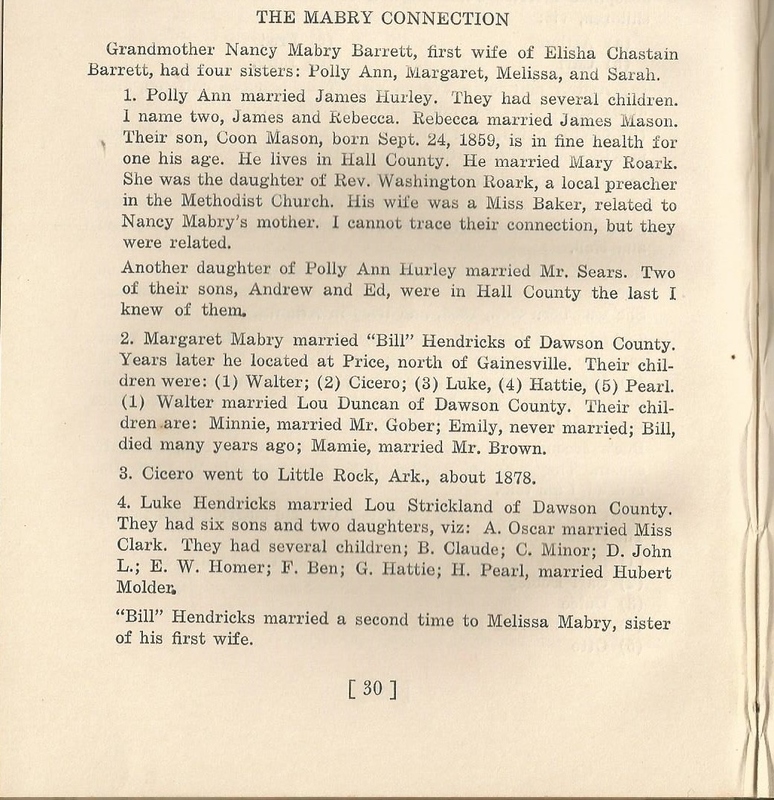 Nancy Elizabeth Barrett Camp (1849-1925) was the tenth and youngest child of Elisha Chastain Barrett (1806-1886) and Nancy Mabry Barrett (1810-1849).